emotional closeness; to improve their health; to confirm their attractiveness; to satisfy their partner. 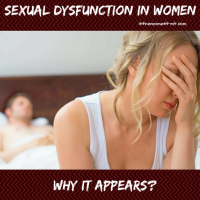 In established relationships, woman often lacks sexual desire, but as soon as sexual desire causes excitement and a sense of pleasure (subjective activation), genital tension (physical sexual activation) also appears. The desire for sexual satisfaction, even in the absence of one or multiple orgasms during sexual intimacy, is physically and emotionally useful for initial stimulation of woman. Female sexual cycle is directly influenced by quality of her relationship with her partner. Sexual desire decreases with age, but increases with appearance of new partner at any age.